You probably found this review because you are looking for a good LED growing light from a reputable brand. 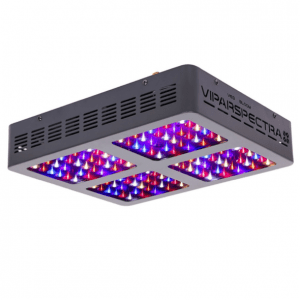 The Viparspectra 600w Reflector is a 600w full-spectrum grow light that embraces aluminum cooling heat sinks reflector design. The grow light supplies just the right amount of light in every phase for your crops. With this light, your crops can grow healthy and abundant. This makes it one of the best indoor growing lights from a reputable brand. 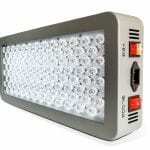 This light is included in our list of the best 600w LED grow lights. Click the link for more recommendations. If you want a budget-friendly grow light that also promises quality, then the ViparSpectra V600 is the LED growing light for you. The Viparspectra V600 is known for its full-spectrum, that provides the ideal light in each growth phase. It makes the grow light perfect for every kind of plant and garden. The grow light’s panel comes with 120 red, blue and white 5-watt diodes from Bridgelux or Epileds. These LEDs provide the full spectrum of light, so you know its quality is guaranteed. The grow light also comes with mirror-like reflectors around its diodes that can distribute light effectively to cover a larger area. The diodes are arranged in an even cluster throughout the panel for proper light distribution. The Viparspectra grow light is energy-efficient as well because it consumes just 136 watts and that is almost half compared to what HPS lights consumes, making it one of the best LED grow lights 600-watt products. The panel of the Viparspectra 600w led grow light has two 4.72-inch fans for cooling that pull in cool air through the side vents. The air moves across the high-quality aluminum heat sink and then gets blown out through the top. This is pretty typical for any LED grow light panel. These fans are different, though, in that they are extremely silent, making them great for simple noiseless use. 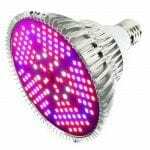 Since LED grow lights are 70% cooler than high-pressure sodium (HPS) lights, you only require a small exhaust fan to get clean air rather instead of a larger one to get rid of excess heat. The panel is cool and never goes above 78 degrees Fahrenheit. 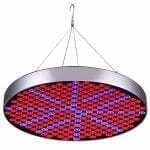 About 24 inches is, therefore, the ideal height to hang the Viparspectra V600 above your plants, without burning them. 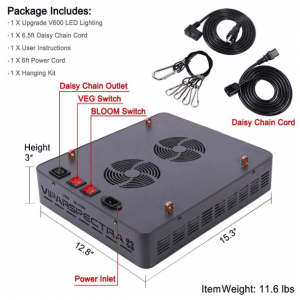 The ViparSpectra 600w is an 11-pound lightweight product. Dimensions are 15.3×12.8×3-inch. This makes it compact and ideal for use in small growing rooms. It has one of the most high-quality designs that provides even light distribution, with a built-in option to switch between veg and bloom modes. With its incredible size and design, the light can supply an entire garden in a small grow room easily. The quality and design clearly show how much time, research, testing, and development went into making the ViparSpectra V600. The grow light comes with a standard 3-year warranty along with a 30-day money-back guarantee from the company. The Viparspectra V600 is a strong and durable grow light that gets the job done for a good price. The grow light’s power consumption and even coverage make it a great product to have in smaller growing areas. The Viparspectra 600w is robust, reliable and manages to work well to the best of its abilities. 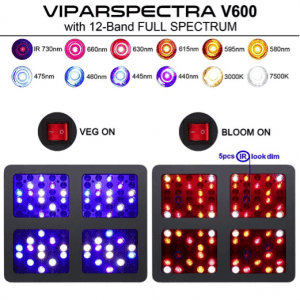 Are you looking for a smaller LED grow light that looks like the Viparspectra 600w? Viparspectra also made the Viparspectra 300. Read our review right here!